Rumplestiltskin and Cora? Does it make your skin crawl a little? In “The Miller’s Daughter” we learn that Cora (Barbara Hershey) was not always evil and manipulative. Well, maybe she was manipulative, but she wasn’t always so bad. Rose McGowan plays the younger Cora, and does a nice job of evoking Hershey’s voice and facial expressions. When Cora was a maiden she was beguiling enough to woo the lovelorn Rumplestiltskin (Robert Carlyle). I don’t mean the meek Rumplestiltskin, but the scraggly-faced-after-becoming-the-dark-one version. So, as strange as it may seem now, Rumple and Cora had a torrid love affair before she embarked on her evil quest for power. I thought this episode was one of the best of this season. It reminded me of a season-one episode in that it combined all the right elements of pertinent flashback Fairytale Land stories with some exciting stuff happening in Storybrooke. 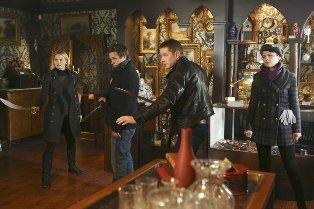 In the previous episode, Mr. Gold was critically injured by Captain Hook (Colin O’Donoghue), which forced him to make a hasty return home with Emma (Jennifer Goodwin), Neal (Michael Raymond-James), and Henry (Jared S. Gilmore) in tow. Actually, if I remember right they made a big deal about whether Neal could steer the ship in the last episode (Hook was left behind in New York), but there didn’t seem to be any issue once they showed him doing it. They could have made it a little harrowing, but this episode was more about the fight with Cora and Regina than that. So Mr. Gold is dying, and it appears that nothing can save him. Cora is bent on not only controlling the Dark One, but becoming the Dark One herself. If Mr. Gold dies of his injuries, the Dark One will evaporate, so she must kill him with his dagger to steal his power. Snow (Ginnifer Goodwin) has decided the only option to save everyone is to kill Cora herself. Though David warns her that murder is not in her nature, Mr. Gold makes it hard for her to resist by giving her an easy opportunity. It turns out he still has the magic candle that Snow could have used to save her mother, but didn’t. Now all she has to do is save his life in exchange for Cora’s and everything will be fine. The cool thing is that Cora’s heart is not in her body. As it turns out, she was so in love with Rumplestiltskin that she had to rip her own heart out to block her feelings for him. Not only was she in love with him, but he was madly in love with her. So that’s why he hates her so much. She broke his heart. It puts a new spin on his character, because we’ve been led to believe that Belle (Emilie de Ravin) was his only true love. I think he at least really loved his wife, Cora, and Belle. I would say, given this new information, that Belle should probably move on with her life, but the dying Mr. Gold called her in the hospital and confessed his true feelings for her. I had to admit it was a pretty touching scene. Actually the most touching thing about it was the moment between Mr. Gold and Neal right after. It was probably one of the most emotional moments on the show because it felt very real. I liked that Neal said he was still angry, but knowing that he could lose his dad at any moment he allowed himself to be close to him. I thought they did a good job of establishing a real connection between them without saying that everything was fine. I don’t know how Neal will feel about his dad still possessing the power of the Dark One. This brings me to the other cool thing about this episode. Snow not only decides to kill Cora, but she figures out a way to make Regina (Lana Parrilla) do her dirty work. She secretly curses Cora disembodied heart, then tricks Regina into putting it back in Cora’s body. She tells Regina that the only way her mother can love her is if Cora has her heart in her body. It’s a totally mean thing to do. Regina is so happy to see her mother’s true feelings for her, and then she is devastated as Cora dies from the curse. And before we feel too sympathetic for Mr. Gold, he of course had all of this figured out. And now that he has found his son, he has no ulterior motives to be manipulating everything, so why is he so happy to pick up that dagger at the end? I have a feeling he is not ready to be rid of the Dark One, no matter how nice he talks to Belle and his son. The very best thing is that Regina hates Snow more than she ever did, and we are back to Regina seeking revenge on her. Though I liked the Cora character, I felt like Regina took a back seat to her, so I’m hoping for more Lana Parrilla in future episodes. Maybe there will be a whole new curse. Of course, I can’t completely discount the idea that Cora is not permanently dead. At any rate, I’m looking forward to seeing what’s to come. They hinted someone dies in the next episode. To me the only one that makes sense is Cora bites the dust or is it Mr. Gold and he gets brought back by the candle??? I was laughing last week because my daughter asked “How is Hook going to get back to Storybrooke”.